urns and hanging a picture up from last year. What about adding a low "something" under the picture? by Annie Sloan's Old White and Old Ochre chalk paint. soften the straight lines...but it seems too stark. "Come on down!" and audition for the mantle? when I see them during the year) might go with the picture. Ummm...too shiny with the urns? Candle holders and vase also with some green? I like the candle holders, but vase is too shiny. Getting closer...try a faux mossy terra cotta vase with the holders. vases that might like to "audition" too. had more of a cohesive look with each other. Uh, oh...I sense a "project" coming on. that I used them last year on the spring mantle. bookcases are looking dark and drab...another "project" to do. at least fifty shades of white in the mantle area. (I have not read the popular novel "Fifty Shades of Grey"
UPDATE...the book has now been made into a movie that came out on Valentine's Day 2015. ...and flop over the poster made into a "painting" last year. ground is starting to green up. click on over to "Add Faux Age To White Pots". over the high points to unify it with the other vases. help make the bookcases lighter and brighter. flowers a number too for being another shade of white. books in paper and wrote the titles out...maybe next time. but happy, spring-like thoughts and themes. up the living room for Spring time! Since there is a lot of "buzz" about the "Fifty Shades of Gray"
"No Minimalist Here" and seven other great bloggers). BEAUTIFULLY done! I love it!! Fun post! I love your poster print that you added some faux paint textures, I remember reading that post last year. Hello there, Miss Kitty! This is my first time visiting your blog. I'm visiting via Marty's "Tabletop Tuesday". First, I want to say that I like your style. No...strike that. I LOVE your style! You're obviously not afraid to keep toiling away it until it's just right. I also appreciate the fact that you like to amass elements to create a cohesive look. I LOVE that you are apparently a graduate of my alma mater: The University of Go Big, or Go Home!!! :-) Girl, those urns with the branches are ROCKIN'!!! This is an excellent teaching tool for novice decorators who think they must buy, buy, buy. Sure, we have to buy some stuff. But some of the best stuff can be "found" or "rescued" like those branches! It also teaches to LOOK AROUND YOUR HOUSE!!! Many people don't realize that what they need has been right there all along!!! Paint can go a long, long way! (I have a couple of paint projects on the back burner myself!) I also really like it that you are not afraid to mix flowers. Some people are. I just think it adds SO MUCH to the richness and texture of the vignette if you mix it up every once in a while! Last, I read your idea to cover all the books in white. I have pondered that same notion, but there are just too many of them! I have reconciled myself to the fact that they are all going to be displayed in their original jackets...and I'll just figure it out from there!!! :-) I love that pillow in the upholstered chair with the brass nail heads, too! OK....I'm getting carpal tunnel. Just wanted to say hello and that I really, really enjoyed your post! Have a great week! P.S. ) I haven't read "Fifty Shades of Gray", either. I have, however, been contemplating using that "theme" (the colors, anyway!) for my kitchen! Ooh my well first I have to say your blog is adorable! I love all your cute kitty details! You really worked hard to get the look you wanted and I love it! I was reading along and said "she needs some plants and greens to unify it" and then you did!! I'm impressed with the work you did to further unify the pots! I love the picture above the mantel too...I love the birch trees and the Annie Sloan finished frame looks really great with it. I need someone around like you to play with the deco stuff, but I'll have to settle for my internet friends! Hi! Thanks for visiting my page, I always love finding fellow alabamians!! I love the green vases on your mantle by the way. And about my frosting, the "secret" additive DOES make it thicker and easier to pipe! The randomly placed white arrangements in your bookcases look fabulous with the white mantle! Thanks for sharing your creative process - I do the same thing! One thing sure did lead to another. I loved your mantle right after you added the candle holders, until I scrolled down a little further. Gosh, all the changes looked fantastic as I scrolled along. You sure a fabulous eye for detail. The painting of the bird nest and the plaque on the bookshelf caught my attention before you zero'ed in on them. Love those two items! Did you paint the picture above the mantle? Love it too. I painted a similar picture 20+ years ago, but mine is in darker tones. Adore the Springy'ness (is that a word) of yours. I'm now your newest follower~Can't wait to see more of your blog. Off to check it out. I love to see mantles being decorated. I enjoyed seeing your work yours - it looks great! I never would have thought to paint pieces so they would go together. 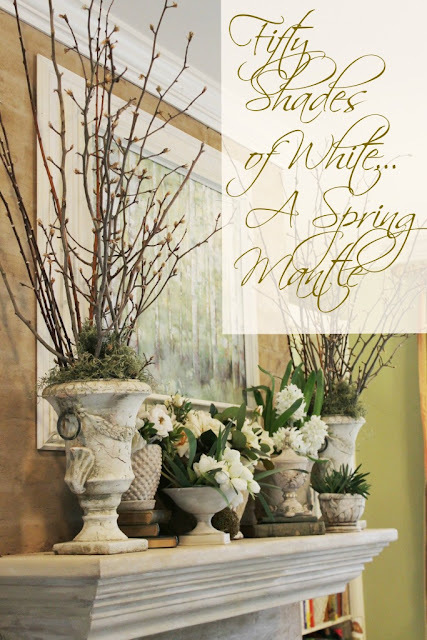 Wow, your Spring mantel is beautiful! I love the "auditioning" you did with your fabulous pieces ... it came together fabulously! Love your artwork, too! Beautiful mantel! Love all the whites! I love how you've taken us through the "process" of decorating your mantel. I really love that tree print, perfect for this time of year! thanks so much for joining in on the party! I love the final result and your play on "Fifty Shades". 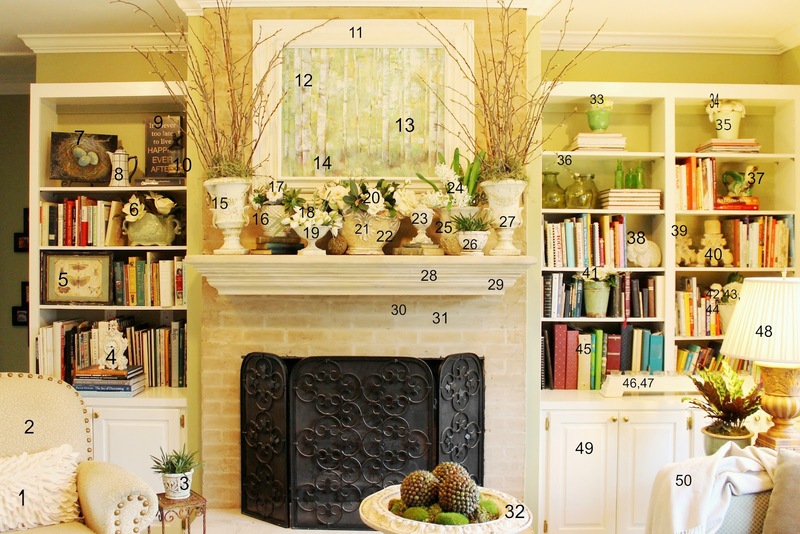 I also like the photo with all the numbers coordinating with changes to the mantel and bookcase. fun post and great thought process. I completely love your mantel. If I start collecting pieces now, I may pull off something similar years from now! Wow...where is the LOVE button...your mantel is so beautiful...love how it mimics your art above the mantel...very nice!